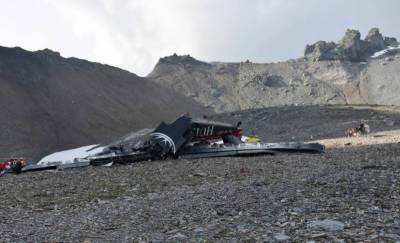 Berlin (Agencies): Twenty people were killed after a vintage Second World War aircraft crashed into a Swiss mountainside at the weekend. The victims were 11 men and nine women between the ages of 42 and 84- seven couples from various parts of Switzerland, a couple from neighboring Austria and their son, and the three crew members. Their names were not released. Ju-Air started operating flights with the vintage prop planes in 1983, and the plane that crashed - with the registration HB-HOT - had been in service with the company since 1985. The one that crashed had logged 10,187 hours of flying time, he said, adding that it underwent maintenance after every 35 hours of flight - most recently at the end of July. He said it had its full annual service during the winter, and "we know of no technical problems with this aircraft."